THIS SITE IS DEDICATED TO THE MEMORY OF ITS CREATOR: DR JANE COLLINS, WHO PASSED AWAY ON 14TH FEBRUARY, 2017. This is a versatile one! 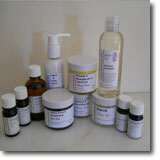 See the description under the product listing in the Aromatherapy section, and look at our blog for more details. Just a brief announcement to let you know that our two best-selling creams: Frankincense and Rose Luxury Cream, and Comfey 'knitbone' therapeutic cream, are now available in 120g jars - twice the normal size - at a bargain price of £9.50. 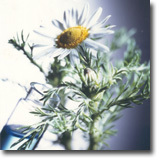 So what we're aiming to provide is a beautiful aroma with health-giving properties. We hope you will agree, you can find them in the product-list to the left of this page. Consider the sumptuous aroma of Rose oil (Otto or Absolute) and the fresh floral essence of Geranium, then put them together. This will give you some idea of of the special fragrance of Rose Geranium, but there is an extra dimension to this extraordinary oil, which originates in the uniquely scented pelargonium roseum (the most gorgeous of over 200 varieties of Geranium). 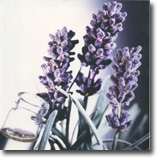 The aroma produces a calming, balancing effect, inducing a feeling of relaxation and well-being. 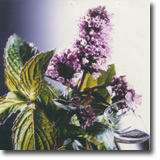 It blends well with Bergamot and/or lavender. For facial creams, try 3 drops of Rose Geranium, with and equal amount of Ylang Ylang and a drop of Bois de Rose in 30g of moisturiser base. Comment: 'That Rose Geranium e.o. is heavenly! I've always liked Geranium essential oil, but the Rose Geranium takes it to a new level.' Alison Harriman, Wolverhampton, June 5, 2018. Our postage and packing is based on the total weight of your package. As you add more items, the total postage displayed in your basket will increase to reflect the increasing rate. Don't forget to specify the destination (UK, Europe or Rest of the World) of your order, so that we can correctly calculate the postage charges as you add further items. Most parcels are sent out via Royal Mail, first class post, which should be delivered next day. Parcels over 2kg are sent out via a carrier and will need to be signed for. If you are not at home, you can leave us with instructions (eg leave with neighbour). Many thanks.